All Linen stock is 30% recycled material. 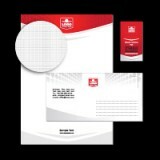 Linen Presentation Folders are printed on a 70 lb Linen Text Uncoated. The linen text gives you a parallel feel and texture with a lighter stock. Linen Text assures a truly distinctive touch.